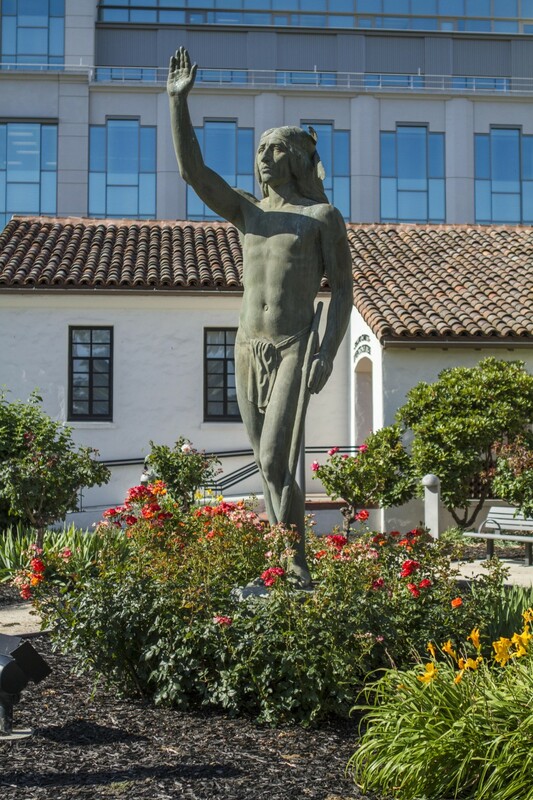 FAIRFIELD — A 12-foot-tall bronze statue of a Native American stands in front of the Solano County Event Center at 601 Texas St., clad in a loincloth, one hand raised in greeting or perhaps a blessing. That’s not an anonymous Native American. It’s Chief Solano, also known as Sem Yeto, the county’s namesake. The depiction is powerful enough that its likeness serves as the centerpiece of the Solano County seal. The real Chief Solano has been depicted in histories as either the noble chief of the Suisun Indians or a man with a mean streak and a tool of pre-California leader Mariano Vallejo. But the idea of a less-than-noble Solano seems to be a more recent phenomena. When the Chief Solano statue was created, no such controversy existed. Newspaper articles of the time don’t reflect such a discussion. In the early 1930s, the Native Sons of California, the Improved Order of Red Men and Degree of Pocahontas decided to immortalize Chief Solano in bronze. Artist William Gordon Huff went with a noble depiction and molded the statue in an Oakland foundry. The idea for a Chief Solano statue had been around for years, the Jan. 22, 1931 Solano Republican reported. Nothing had happened because of disagreements over where Chief Solano had been buried, given the gravesite would be a good location for a statue. H. Vance Clymer of the Improved Order of the Red Men pushed on. He received help from state Sen. Tom McCormack of Rio Vista. McCormack sponsored a law that got the monument erected on a knoll along the Sacramento Highway, four miles west of downtown Fairfield, near today’s site for the California Highway Patrol truck scales. The state provided $5,000. On June 3, 1934, 3,000 people attended a dedication ceremony for the monument on a windy day. Bands played, Native Americans came dressed in native costumes and officials such as McCormack gave speeches. A black-and-white film from the day shows the statue initially covered in a white cloth that gets pulled off. A program for the event said the White Man admits he wasn’t fair to Chief Solano by forcing him to sell a land grant for $50. “It was a sad mistake and it is to the White Man’s credit that he regrets it. The White Man erects to the Red Man a monument in memory of those qualities that are never old – that are great in any man no matter what his color, creed or race – qualities of hospitality and brotherhood,” the program said. Vandals damaged the statue and local leaders decided to move it. The search for a perfect, new home proved somewhat controversial. “Some say the Chief would do well in front of the courthouse, but his southern exposure is not altogether inspiring – and all agree that to place the 12-foot giant on the library grounds near Texas Street or Union Avenue would simply ruin the library,” the Aug. 28, 1938, Solano Republican stated. But the Chief Solano statue did indeed end up in front of the county library at 601 Texas St. The library moved away in 1976 to 1000 Kentucky St. and the county in 2010 renovated original Texas Street building to become the Solano County Events Center. Sem Yeto became Solano when baptized by missionaries at Mission Dolores in 1810. He was named after Francisco Solano, the saint and missionary. Some histories depict Chief Solano as saving the Suisun Indians by establishing peace with pioneer settlers and with Vallejo. Solano died in about 1850 and Vallejo moved to have the county named after him after California formed as a state in 1850. Yet other historians present a darker side, pointing to a supposed eyewitness account of Solano lancing a pregnant woman and a written rebuke to Solano from Vallejo for being involved in a scheme to kidnap Native American children. A noble Solano is part of the county’s creation myth, as much as George Washington’s confession to chopping down the cherry tree is part of the founding myth of the nation. That’s the Solano that Huff immortalized in bronze. Whatever the truth of the matter, Huff’s statue brings out the best in Chief Solano.